No one knows how old the illusion commonly known as the “East Indian Needle Trick” is, but it may be appropriately named. The oldest known magician to perform it was a Hindu of unknown nationality named Ramo Sami (or Samee) who toured America in 1820. It is believed that Houdini, as early as 1899, rescued it from circus sideshows for his stage show. It became a staple of his shows throughout his career. 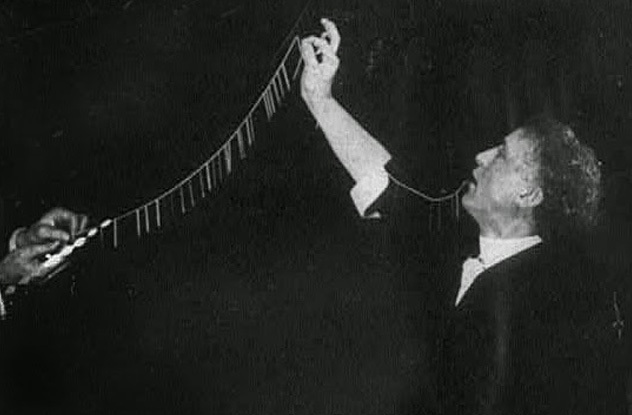 Houdini had a spectator examine 50–100 needles and 18 meters (60 ft) of thread. The same spectator examined Houdini’s mouth. The magician then swallowed the needles and thread all at once with a drink of water. A moment later, Houdini regurgitated them, feeding out the thread, the needles dangling from it. Three years after Houdini’s death, the master’s prop engineer, R.D. Adams, revealed how the trick was done. Houdini placed a packet of thread with needles already attached to it between his cheek and teeth. The needles were threaded with a knot before and after it to keep them from coming loose in Houdini’s mouth. The knots were spaced to give the needles a natural play on the thread. The thread was then rolled into a flattened packet and inserted in the magician’s mouth like a tobacco plug. When Houdini allowed the spectator to examine his mouth, he spread his upper and lower lips away from his gums and teeth with his fingers. The fingers naturally hooked around the lips into the cheek area. Houdini hid the packet under one of the fingers. If the spectator insisted that he move his fingers, Houdini merely slipped the packet under his tongue. Houdini then placed the loose needles and thread on his tongue and pretended to swallow them with a drink of water. In reality, Houdini spat the needles and thread into the water glass, leaving enough water in the glass so that the reflection obscured them. If the spectator remained nearby, Houdini slipped the loose needles under his tongue and kept them there until the end of the trick. Once finished, he’d take another drink of water, spit out the needles, and quickly hand the glass to an assistant. Finally, Houdini spooled out the packet of needles from his mouth. Houdini performed a variation of this trick using razor blades. He kept the packet of pre-threaded blades in a fold of a handkerchief. On the same handkerchief, Houdini displayed loose blades to the spectator. When he supposedly placed the loose blades in his mouth, he actually placed the packet. He simply handed the kerchief to an assistant with the loose blades inside while he finished the trick. The image above is almost certainly a staged publicity photo. The needles in the shot are far too large for Houdini to hide in his mouth. Houdini only performed this illusion a few times in a week-long run in New York City in July 1914, but it caused a sensation. 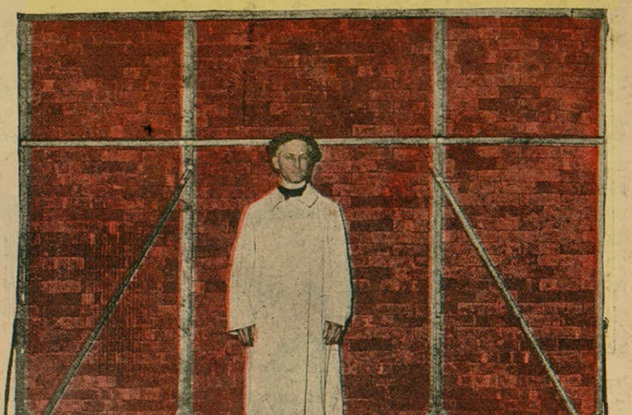 While Houdini performed other tricks, bricklayers erected a wall 3 meters (9 ft) high and 3.5 meters (10 ft) wide on the stage, perpendicular to the audience, so that the they could see both sides of it. The wall was built atop a large carpet of muslin, supposedly to prevent the use of a trap door. Once the wall was finished, Houdini invited the audience to use a hammer on the wall to show it was solid. The key was the rug. Instead of preventing the use of a trap door, it facilitated it. The trap was oblong and traversed both sides of the wall. Once it sprung, the carpet or sheet formed a V-shaped hammock so Houdini could crawl under the wall. According to R.D. Adams, Houdini also performed a variation on this illusion. In it, Houdini placed a solid plate of glass under the brick wall, which indeed made it impossible to use a trap door. The screen was wheeled in front of Houdini by several assistants dressed in nondescript work clothes. After the screen obscured Houdini, he quickly changed into work clothes and joined the assistants as they walked around the back end of the wall to park the second screen on the other side. Behind the second screen, Houdini stayed and changed back into his stage clothes. Meanwhile, mechanical hands that were mounted behind the first screen waved to the audience, fooling them into thinking that Houdini was still behind it. A moment later, both screens were pulled away, revealing Houdini miraculously on the other side. Houdini passed this trick to his brother Hardeen to use in his act. Many have speculated that Houdini stopped using the illusion because it was not his own. He’d purchased it from another magician—or even stole it, claimed a rival. The controversy (and the fact that so many knew the trick’s secret) probably made it too risky for Houdini to keep performing it. One of Houdini’s earliest acts was for him to advertise that he could escape from any handcuffs the audience or the local police could provide. His handcuff act impressed theater manager Martin Beck, and in 1899, he gave Houdini his first big break to tour vaudeville stages. There was no single secret to Houdini’s handcuff escapes. The illusionist studied locks all his life and had an encyclopedic knowledge of handcuffs. He looked at the cuffs and knew what kind of key he needed. He then concealed the needed key on his person. Later in his career, Houdini invented a belt made of flexible steel that rotated on ball bearings with the flick of his elbow. The belt had several compartments with a variety of keys and picks to use. Some cuffs didn’t require a key. He revealed in 1902 that some cuffs opened by banging them against a hard surface. When he came to a town, he’d often research the cuffs used by the local police. In his book Handcuff Secrets, he demonstrated that a loop of string could pull the screw out of a cuff’s lock. Sometimes, Houdini had to free himself from so-called freak handcuffs, one-of-a-kind cuffs with only one key to open it. In that case, he insisted on testing the key first. While he fiddled with the cuffs, an assistant headed backstage and searched Houdini’s huge collection of keys for one that looked similar to the freak key. The assistant handed the fake key to Houdini, who then returned the fake key to the owner while he palmed the real one. Houdini wasn’t above using specialized handcuffs. When he performed his famous bridge jumps into rivers with his hands cuffed, he often used “jumpcuffs.” These cuffs had a weak interior spring and would pass inspection. Once Houdini hit the water, a flick of the wrist opened the cuffs. Only twice was he nearly flummoxed by handcuffs. The first time was in Blackburn, England at the hands exercise trainer and future writer William Hope Hodgson. Hodgson trussed Houdini up so enthusiastically that it took Houdini an hour and 40 minutes to free himself, complete with bloody welts. The second time was in London, where the Daily Mirror took up Houdini’s challenge. A Mirror reporter searched and found a Birmingham blacksmith who had spent five years making cuffs that were allegedly impossible to pick. 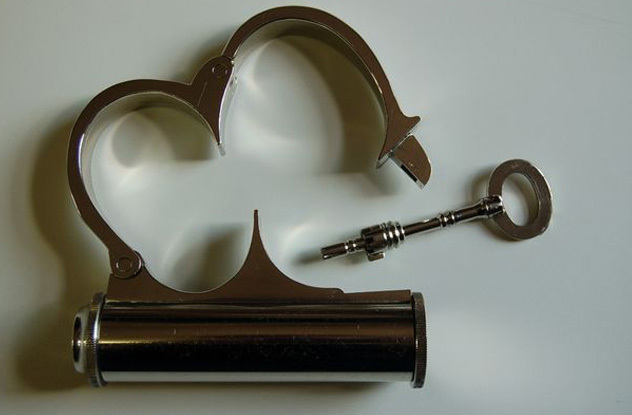 The “Mirror Cuff” featured a set of nesting Bramah locks. It took Houdini an hour and 10 minutes to free himself. Some experts speculate that the entire Mirror Cuff performance was set up by Houdini, and he had a duplicate key the whole time. They claim that he took 70 minutes to unlock the “Mirror Cuffs” for dramatic effect. Houdini told spectators to examine his milk can, allowing them to kick it to verify its sturdiness. The can stood about 1 meter (3 ft) tall, and the lid had six hasps that slipped over six eyelets attached to the can’s collar. 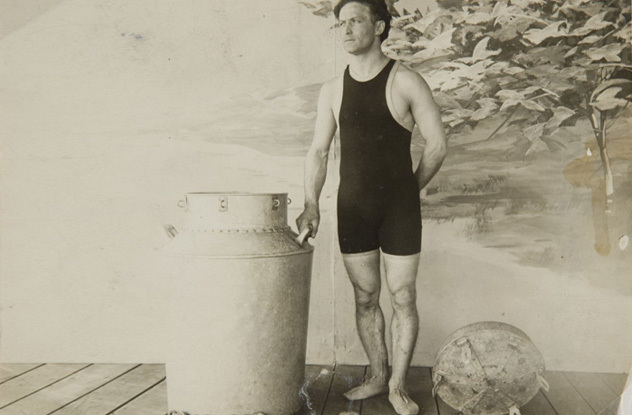 Spectators filled the can with water while Houdini changed into a bathing suit. When he returned, he asked the audience to time how long they could hold their breath. Few could exceed 60 seconds. Smiling, Houdini climbed into the milk can, excess water spilling out. When the lid was placed atop it, Houdini was forced to submerge his head. The six hasps were secured, and locks (sometimes supplied by spectators) were clasped on the eyelets. By then, Houdini had already been underwater for at least a minute. A screen was erected around the can. Two agonizing minutes later, Houdini emerged, wet and out of breath. The locks on the milk can’s lid were still in place. A few years after his death, a friend of Houdini revealed the secret: The collar was not really riveted to the can. The simple construction of the milk can made it appear secure, but the collar rivets were fake. Because the collar was tapered and greased, anyone who examined the milk can could not pull the collar off or even budge it. But anyone inside could easily push the collar up and climb out without disturbing the locks. Houdini’s career was a steady progression of increasingly great escapes. When handcuff escapes grew stale, he moved on to jail escapes. In 1907, he jumped from bridges, handcuffed. In 1908, it was the Milk Can Escape. Finally, in 1912, it was the Underwater Box Escape. That same year, he debuted his ultimate escape: the Chinese Water Torture Cell. The secret, of course, lay in the crate’s design. First, the crate had small holes in it to allow Houdini to breathe while he waited for the box to be nailed, trussed, and chained. They also allowed the crate to sink. Second, the crate was square, with four boards on each side. On one of those sides, the bottom two boards were not nailed to the crate. They only sported nail heads. Instead, the boards were a hinged trap, the opening secured by a latch. According to R.D. Adams, Houdini removed his handcuffs while the crate was nailed shut. He then waited until the crate was in the water, opened the trap, and swam to the surface. During one box escape, Houdini waited until the crate hit the river bed before he opened the trap. The crate landed with the trap at the bottom, and the muddy bed kept the hinged door from opening. Only after desperately flailing against the side of the crate could Houdini release the trap. Ever afterward, Houdini made sure the trap was open before he reached the river bottom. Performed only once on January 7, 1918 in New York’s Hippodrome Theater, the largest stage in the world, the Vanishing Elephant was Houdini’s most famous illusion, rivaled only by the Chinese Water Torture Cell. 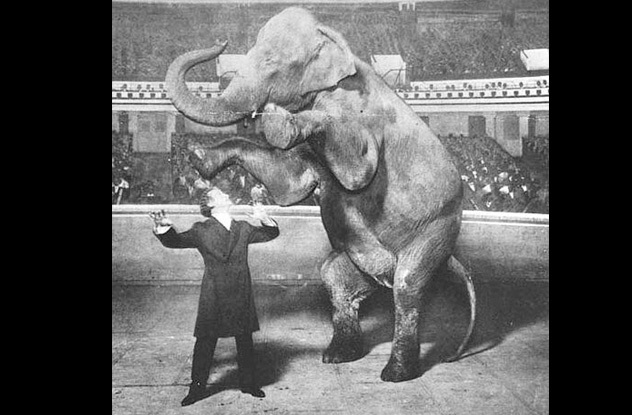 Houdini led an elephant into a large cabinet. And then it disappeared. As did the solution to Houdini’s trick. The cabinet was lost, and since the illusion had been performed only once, few were privy to its secret. Even contemporary newspaper accounts of Houdini’s performance no longer exist. For years, the secret to the Vanishing Elephant was believed lost to history. To piece together the illusion, we start with the Hippodrome stage. The Hippodrome no longer exists, but photos of it show a massive, 5,697-seat theater. The seats were in three semicircular tiers. No spectator had a perfect view of the elephant cabinet, which sat well back from the edge of the stage. The cabinet’s appearance is disputed. R.D. Adams claimed that it was merely a cage-like framework. According to Adams, the lower part of the framework hid a roll of cloth identical to the rear curtains. Wires attached the cloth to a roller with a spring so strong that it had to be wound by two men. At the appropriate moment, Houdini fired a gun, causing the audience to blink. As they blinked, the roller yanked the cloth up in front of the elephant, making it seem to disappear instantaneously. Another description of the elephant cabinet states that it was oblong, on wheels, and had double doors on one end and a huge curtain on the other. The double doors in the back had a circular opening in the middle, providing limited illumination inside the cabinet. After the elephant and its trainer entered the cabinet, the curtain was drawn, and several assistants slowly turned the cabinet around. Meanwhile, the trainer moved the elephant to the back side of the cabinet, and a black curtain was pulled over them both. When Houdini pulled open the front curtain, he had the cabinet turned again so that no one in the audience could see the interior for an extended amount of time. All they could see was the circular light from the back and a darkened interior, the elephant apparently gone. Unlike Houdini’s elephant cabinet, his Chinese Water Torture Cell still exists, and we know how it worked. 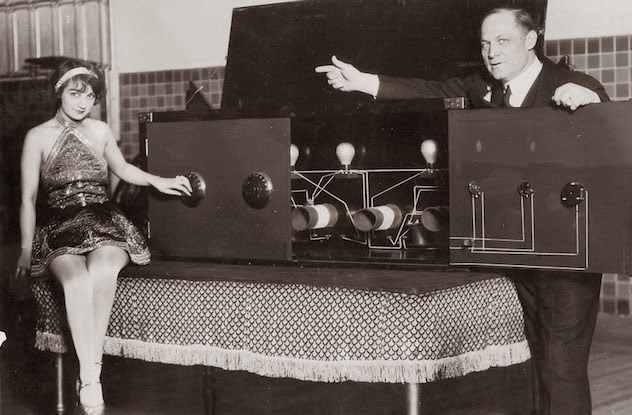 The great magician had the cell custom made for $10,000 and patented it. It looked like an oblong aquarium turned on its side, it had a mahogany and nickel-plated steel frame, and its plumbing fixtures were brass. It was 67 centimeters (26.5 in) wide and 150 centimeters (59 in) tall, weighed 3,000 kilograms (7,000 lb), and held 950 liters (250 gal) of water. The front plate of glass was 1.5 centimeters (0.5 in) thick and tempered. It disassembled into three crates and four cases, and Houdini always traveled with a second cell just in case something happened to the first. Houdini began the illusion by asking an audience member to name any part of the stage. The cell was moved wherever the spectator indicated, proving that the trick wouldn’t use a trap door. As heard on the video above, Houdini allowed the spectator to examine the cell and offered $1,000 if they could prove Houdini could obtain oxygen while inside the cell. Houdini then lay on his back, and assistants put his feet in mahogany stocks. Pulleys lifted the magician into the air upside down, and he was lowered into the tank head-first. The stocks acted as a lid with four hasps that were padlocked to the tank. Drapes were pulled across the tank, and an assistant remained nearby with an axe, ready to break the glass if things went wrong. The orchestra played “Asleep in the Deep.” Two minutes later, Houdini emerged from behind the curtain. The stocks were still at the top of the tank, the locks still in place. Two things were critical to the illusion. First, the stocks were deep-set. When Houdini was immersed into the tank, some of the cell’s water flooded over the top edge and out of the tank, allowing a small pocket of air between the water’s surface and the stocks. Second, the mahogany boards that formed the two sides of the ankle stocks separated slightly when the hasps were locked. Once the curtain was drawn, Houdini used the sides of the tank to push his feet upward, twisted sideways, and pulled his feet through the enlarged holes in the stock. He then drew his feet to his chest, flipped, and took a breath in the air pocket. The two stock boards were also hinged to open, and Houdini climbed out, closed the stock boards, and presented himself to the audience. There is an urban myth that Houdini drowned in the cell. Not true. He died in a hospital bed from an infection caused by a ruptured appendix. He had only one accident while performing the act. On October 11, 1926, while the pulleys were lifting Houdini, a cable came loose and the stock shifted, fracturing Houdini’s ankle. Steve is not a magician, just deeply curious about Harry Houdini and how he fooled the world.